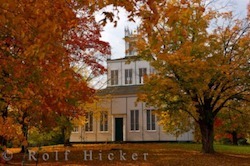 There are 163 national historic sites in Canada, each one eager to impart a bit of Canadian history to all visitors. Canadian history fans need look no further than Parks Canada for a dose of fun. They manage all national historic sites and national parks across the country. While the parks protect the geology, wildlife and environment of Canada, historic sites preserve the history of Canadian culture, economy, community, and people from coast to coast. You'll find the Parks Canada sign anywhere of historical significance, be it an early native petroglyphs site or a northern riverboat's final resting place. The Klondike was a golden period of Canadian history, when thousands rushed to Canada's north after talks of gold in the Yukon. Dawson City became a boom town, the central jumping off point for any gold-hopefuls heading to the hills. 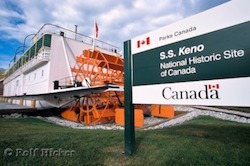 The S.S. Keno in Dawson City is representative of the steamboats that plied the waterways of the Yukon during the Klondike Gold Rush at the turn of the century. These riverboats carried supplies to mining camps deep in the hills, and returned with loads of gold, silver, lead and zinc. Now berthed at Dawson City's pier, the S.S. Keno is one of the many Gold-Rush era attractions of the city. The Yukon rivers are not the only waterway of historical significance in Canada. The Rideau Canal is a 202-kilometre (125-mile) man-made canal that runs from Lake Ontario at Kingston to the country's capital, Ottawa. The canal was built between 1827 and 1832 in anticipation of dispute with the Americans along the St. Lawrence River (this in the wake of the war of 1812.) The canal bypassed the international waterway to the South and made possible an all-Canadian route to the Great Lakes. The Rideau Canal never saw great battles, though it was the choice commercial route between Montreal and the Great Lakes until 1849. Today, it still stands as an impressive feat of engineering and a well-traveled pleasure craft route. Bar U Ranch in Alberta celebrates another commercial age of Canadian history. These were the days when the West belonged to cowboys and outlaws. Nestled in rolling foothills and with the Rocky Mountains as a backdrop, Bar U takes visitors on a learning tour of ranching life a hundred years ago. Cattle and wheat were world staples, and this was one of Canada's most successful commercial ranches. 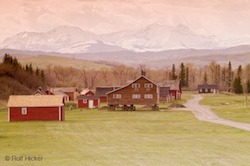 Visitors to the site can take a wagon ride past fields and outbuildings of the ranch. The historic sites in Quebec are largely military. Forts and historic battlefields where early Canadian history played out are preserved by Parks Canada in the only all-Francophone province of Canada. In Quebec City, the old port is a UNESCO world heritage site. While the Canadian interpretation center is closed for renovations until 2009, visitors can still admire the cobbled streets of the Vieux Port below the looming shadow of the Chateaux Frontenac. Historical fiction fans will find their inspiration in Cavendish, Prince Edward Island. Here, the house of Green Gables offered up inspiration aplenty for Lucy Maude Montgomery's classic tale, Anne of Green Gables. Meanwhile, L'Anse-aux-Meadows serves as a reminder that Europeans were coming to Canada long before the gold rush. This national site in northern Newfoundland is the oldest European settlement in North America, abandoned 1,000 years ago by the Vikings who landed only briefly on the northern coast. Of course Canada wasn't built solely by European immigrants. The country owes much of its cultural history to the First Nation people who lived here long before. In Kejimkujik National Park, the Mi'kmaq people paddled the lakes and rivers of central Nova Scotia and the historic site protects fading petroglyphs of this nomadic culture. Some National Historic sites can be visited in just an hour, while others will demand an entire day or more. Each site will offer up a new experience. Knowing the past, you'll walk away with a new appreciation for the country today. If you are planning a trip in Canada, be sure to check out what national sites you want to take in. Many sites are associated with a national park. In this case, why not spend the night at a campsite and share stories of battles and gold rushes around the campfire. You could also cast around for a nearby bed and breakfast where you'll likely hear more local tales and colourful town history. It is worth asking your tour guide for recommendations on local food. You never know where you'll discover a favourite dish.